It’s been a while since I made a pasta dinner. 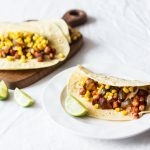 When I’m pressed for time I tend to default to grains and legumes, soups and stews, dinner salads and tacos. Pasta doesn’t cross my mind, in spite of the fact that it’s quick cooking and easy to make. This year, I’m on a mission to make it more often and more creatively (marinara is my default–hardly inspiring), especially since Steven is a huge pasta lover. 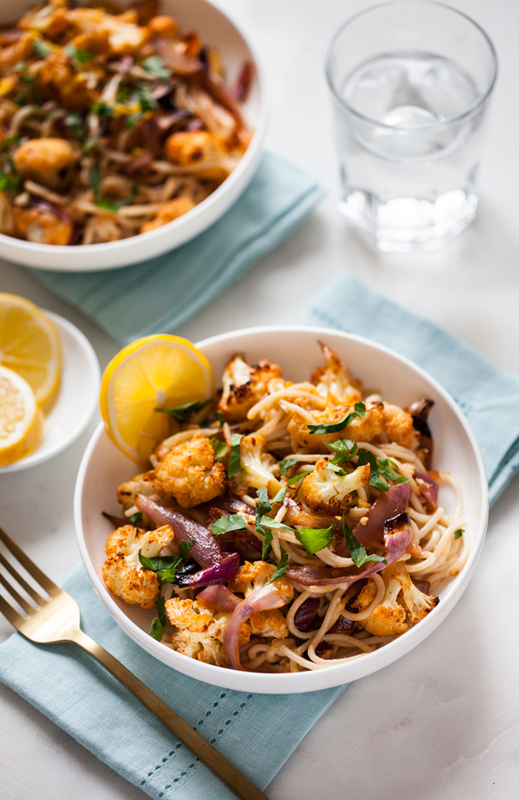 This spicy roasted cauliflower lemon pasta is a delicious place to start. Today’s recipe was created with the help of a new (to me) type of cooking oil: algae oil from Thrive. Algae has been getting quite a bit of attention lately as a source of sustainable nutrition, but every time I’ve read about it, I’ve wondered what culinary forms it would take. Thrive oil starts with harvesting of algae, which is then fermented in tanks and pressed to release the oil. The company’s mission is to a sustainable source of oil–one that can be produced more plentifully with fewer acres of land and minimal carbon and water footprints. Algae oil also has the distinction of being incredibly low in saturated fat (about 75% less than olive oil, which is already pretty low) and high in the monounsaturated fats that are associated with cardiovascular health, high HDL (or “good” cholesterol) and low LDL (“bad” cholesterol), and steady blood sugar and insulin levels. Dr. Dean Ornish, who has studied plant-based diet and its potential to help reverse heart disease, is on Thrive’s nutrition advisory board. 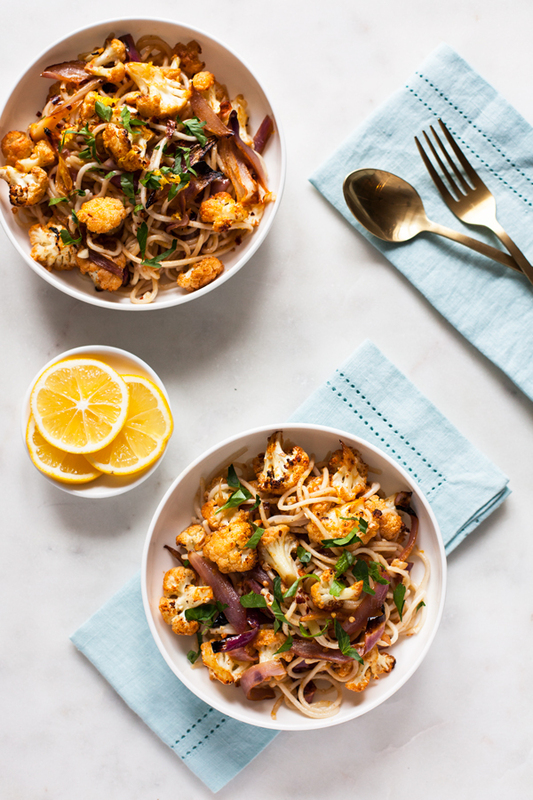 One final, distinctive feature of Thrive oil is that it’s stable at very high temperatures–up to 485F–which means that it’s great for high temperature roasting (and perfect for the spicy roasted cauliflower in this dish). Back to the food! 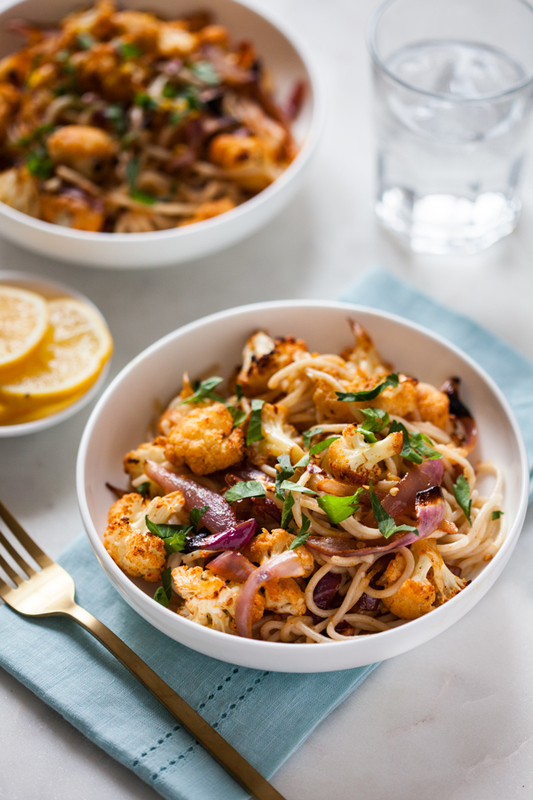 This pasta capitalizes on the wonderful, crisp texture of oven roasted cauliflower, savory-sweet notes from the red onions that roast with it, and lots of brightness and acid from lemon juice and zest. Garlic gets sautéed at the very end and stirred in with everything, making the pasta super flavorful in spite of its simplicity. I wasn’t sure how Steven would feel about the pasta, as it was a new recipe for both of us. He loved it, so much that we dove into the dish for lunch after I took photos, rather than waiting to eat it for dinner! That’s a strong endorsement from us both. Here’s the recipe. Preheat the oven to 400F. 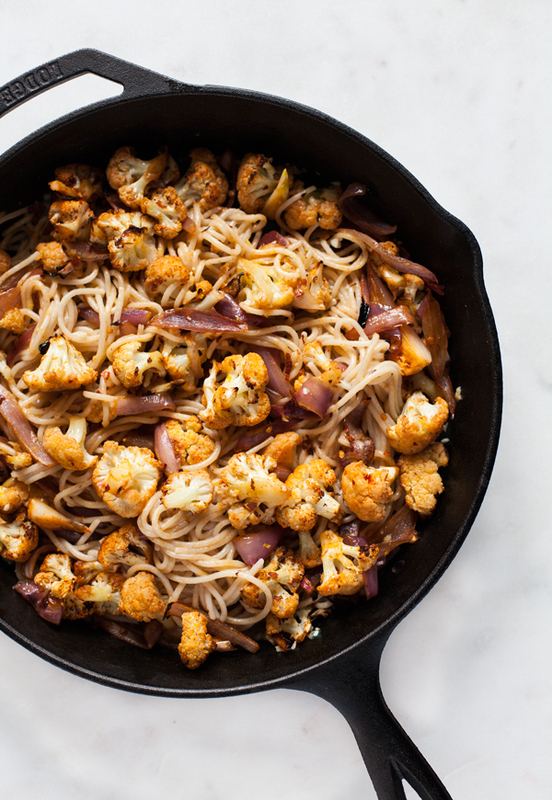 Toss the cauliflower, red onion, and paprika in one tablespoon of the oil. Transfer the vegetables to two parchment or foil-lined baking sheets. Sprinkle generously with coarse salt and crushed red pepper (less generously with the pepper, if you're sensitive to heat). Roast for 20-25 minutes, or until the cauliflower is tender and crispy on the edges, stirring once halfway through. While the vegetables roast, bring a large pot of salted water to boil. Add the pasta. Cook according to package instructions, stirring frequently, until the pasta is done. Drain, reserving ½ cup cooking water. Heat the remaining tablespoon of oil over low heat in a large saute pan. Add the garlic and cook for about a minute, or until it's fragrant but not burning. When the garlic is ready, add the pasta, the lemon juice and zest, the parsley, and the roasted vegetables. Stir everything together, then add extra salt and an extra dash of crushed pepper to taste. If the pasta feels too thick or is sticking together at all, stir in a splash of the cooking water. Serve right away. 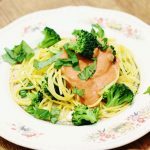 Thrive oil works well in this recipe because its flavor is so neutral (not exactly what you’d expect from anything that’s algae-derived!). 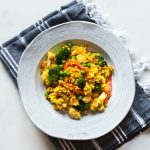 All of the other flavors–garlic, lemon, red onion, spicy red pepper flakes–are given a chance to shine through, and they shine very brightly. Perhaps the only downside of Thrive is that it doesn’t have the fruity flavor of olive oil or the nuttiness of a nut oil, so it’s not the best choice for, say, dipping bread. But for any high temperature cooking for which you want a neutral flavor and low saturated fat content, it’s a perfect choice. Hope you’ll give this wonderful pasta dish a try. 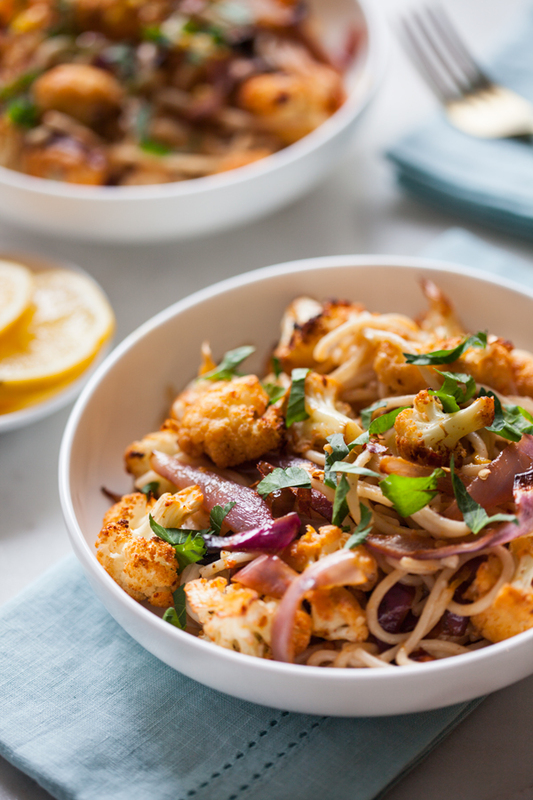 And it’s worth saying that a good sprinkle of my hempesan will make a great addition to the spicy roasted cauliflower pasta, along with any other salads or grains you have on the menu for your week. Curious about trying Thrive oil for yourself? You’re in luck. Thrive is offering to share a bottle of their oil with a Full Helping reader (US only). If you’re interested, enter below to win. I’d love to hear about what sort of tasty vegan recipes you’d use the oil in! Good luck, folks. And I’ll see you very soon, for new weekend reading links and recipes. 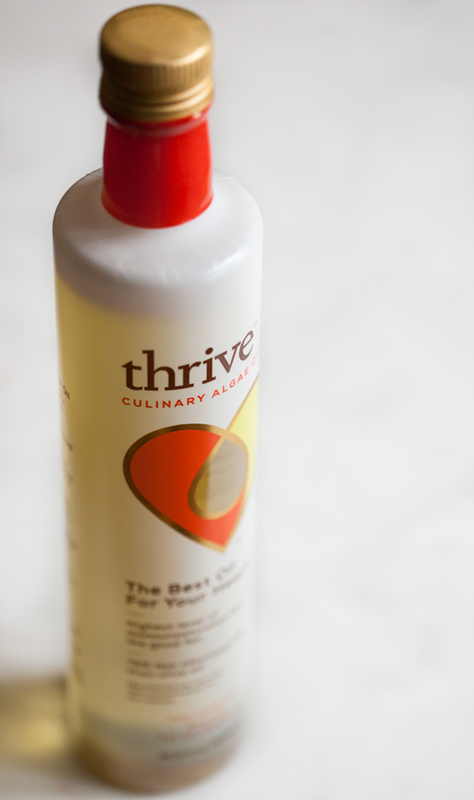 Today’s post and giveaway is sponsored by Thrive Algae Oil. As always, the opinions expressed are my own. I appreciate your support! I would like to roast cauliflower with this oil. I love roasted veggies! I think Thrive oil would be really great for cooking any vegetable that’s getting a flavorful sauce on it–I always feel like bad using oilve oil in those cases. Especially for pan frying marinated tofu! Roasted sweet potato fries would be delicious with the algae oil! I could see this oil being great for baking if it’s really neutral! And the high smoke point would make it good for grilling/ roasting! I’m definitely going to have to check it out! I’d love to try this with other roasted vegetables, like butternut squash and Brussels sprouts. And I’d be curious to see what it is like in baked goods as well! At the end of step 2…”reserving 1/2 cup of the cooking water” but you don’t mention in step 3 what to do with it. Deb, thanks so much for catching. I reserve the water in case any of the pasta starts to stick together or feel heavy at the end of the recipe — so, it’s something you add a splash of as needed. I edited the instructions to reflect! I would love to try roasting vegetables with the oil! I’d try it with anything, especially fried or roasted vegetables. I would probably give the oil to my mom. She usually uses olive oil to stir fry veggies with her dinners. Maybe she would like this oil too. So great to see this today! I was actually just googling the other day to find a good high heat cooking oil, thanks so so much for the tip! I’d love to try it in a stir fry! I’d love to try the oil for baking sweet potato wedges, or even kale chips! This pasta dish looks so good. I can’t believe you don’t make pasta when you are in a hurry. It’s so easy to make and you can add so many veggies to the pasta 🙂 Anyways, I am looking forward trying this pasta. Happy weekend! I would like to try roasting vegetables with this oil! What does it taste like? Very neutral, Melissa — I’d compare it to canola or grapeseed oil in terms of taste. i would love to use it for roasting a big pan of root vegetables! Roasted cauliflower has been my latest obsession. It tastes so amazing! I have been wanting to try algae oil since i first read about it. Sadly I don’ thave any local stores that sell it yet. I’d love to see this high-heat oil crisp up some sweet potato fries! Do you know if Thrive’s algae oil is a source of EPA/DHA or is it somehow refined out? I tried this today, with simple olive oil, juice of a whole lemon and without parsley (did not have any at hand). 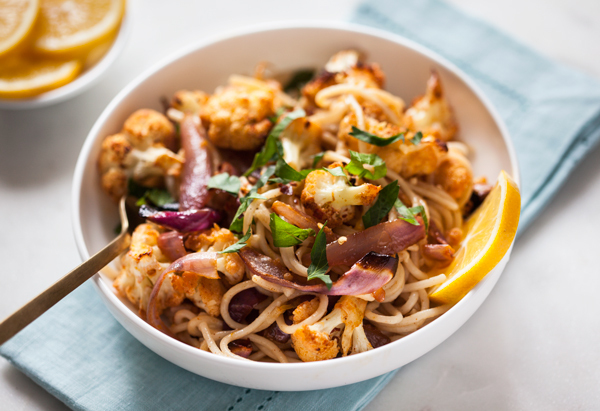 Served it with wholegrain pasta – delicious! Thanks for the simple yet yummy recipe. I’m so happy the recipe was a success, Britta!